1. When did your love of cooking begin? I really started loving cooking when I moved out of home and started cooking for myself. But, my earliest baking memories are from when I was a child and I baked with my grandmother for the Jewish High Holy Days. 2. When and why did you start your blog? I started my blog in September 2009 because I wanted to write a restaurant review. It just took off from there, and now I am posting at least three recipes a week. 3. Where did the name Lavender and Lime come from? I started writing a recipe book in 2001 and that was the name of the book. I decided to call my blog the same so that when the book was published there was already a link. 4. What is your favourite part of blogging? 5. What is your day job? I am a branch manager for a hardware wholesaling company and a motor spares accessories company. I also run my own business selling natural and organic products. 6. What, apart from blogging are your hobbies? My first love is motor sport but I also love to read and exercise, by taking walks on the beach with my dogs. 7. What’s your favourite fallback meal? It would have to be roast chicken. I always use Woolworths organic chickens and I make a trivet of chicken wings. The chicken gets stuffed with herbs, lemon and garlic and this recipe never lets me down. 8. What is the most adventurous meal you’ve ever made? The most adventurous recipe would have to be the dried shitake mushroom and apricot biscotti that I made for Delheim wines. The most adventurous meal is the duck egg ravioli I have made as prompted by this interview. 9. What dish do you steer clear of making because it’s a) too convoluted, b) too complicated? I have yet to come across a recipe I won’t try, and if I don’t get it right the first time I will try again. In fact, the simplest of recipes has taken me the longest to perfect. 10. What food blogs do you follow? I read a lot of food blogs! 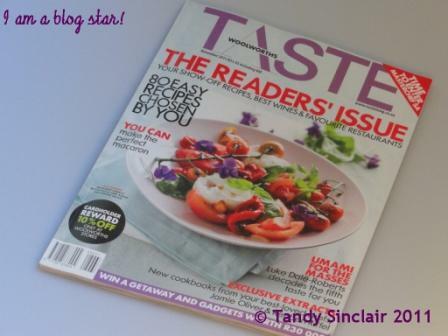 I read most of the blogs on Taste, and some of the ones on food24 plus a wide selection of local and international blogs. I have a daily few which include amongst others The Only Cin from South Africa, Fig Jam and Lime Cordial from Australia, Chica Andaluza from Spain and The Kitchens Garden from America. 11. Tell us a bit more about your blog’s weekly challenges? And your daily diary? The weekly challenge is my way of getting through all the recipes I have collected over the years. I do a regional and seasonal challenge once a month to highlight that we need to support our local farmers. The daily diary is a pure transposition of my paper journal I have kept for years. There is something so permanent about putting it on line and I really get to look back over my day and see that there is always something to be grateful for. 12. Which three ingredients would you take to a desert island? 13. What kitchen gadgets wouldn’t you be able to live without? I have a lot of kitchen gadgets – my bread maker gets used once a week but I could live without it! I think it would have to be my Wusthof Chef’s knife, and my Scanpan pots – the rest of the gadgets are just to make my life easy, but with a good knife and a good pot, you can cook anything. 14. What would your last meal on earth be? This changes depending on when I am asked. But, I think it would have to be roast chicken with all the trimmings. 15. What is your food philosophy? Eat local and eat well. If you treat your food and your body with respect, you will be healthy. This is awesome! Congrats to you! Congratulations. It makes me so pleased when I hear that food bloggers are having success. May it long continue. I bought the Taste to read the article!! You deserve this, Tandy!! Great interview and so nice to get to know you better….so accomplished…and I like your sentiments about food and cooking. I also learned to cook when I left home….motivated by a love of eating! Yay – am on my sofa doing a one man Mexican wave for you! Congratulations on this well deserved accolade and interview. And thank you so much for mentioning my blog – am feeling very chuffed 🙂 Good to learn a little more about you too, well done Tandy. Congratulations & Well done on the interview as well.